One question that’s come up more often in recent years: Colleges don’t actually spend time looking at everyone’s Facebook, Twitter, Instagram, Snapchat, etc – right? DO: Have a LinkedIn that shows admissions officers that you’ve volunteered at your local food shelter or participated in Model UN. LinkedIn isn’t just for your job résumé. It also lets people mark your specific skills and lets you show your volunteering experience and achievements. DON’T: Complain about your retail job on public social media accounts. Yeah, your boss might microwave fish in the break room every day without fail, but complaining online about school or jobs can make you look petty and disrespectful to potential colleges (not to mention future employers). 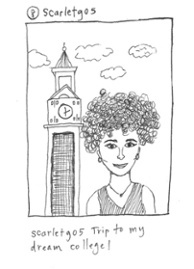 DO: Engage with your dream college on social media by going on a visit and tweetinga picture with you in front of their famous clock tower, tagging your location and the school. This helps show your enthusiasm for their specific school. Just … don’t do it. DO: Back up your admissions essay’s claim that you are politically conscious by posting picture of you canvassing for a senatorial candidate. DON’T: Contradict your essay by making fun of all the presidential candidates for your high school’s student government in a public Facebook post. DO: Make all your accounts private. It’s completely understandable that you’d like to lead a private social life, inaccessible to the Big Brother–like searches of admissions officers. This is another good time to consider LinkedIn or other public professional accounts – that way they see you have some kind of online presence. If you do have a private social media account, we suggest using your first and middle names or some other combination of initials to make you more difficult to find via search.